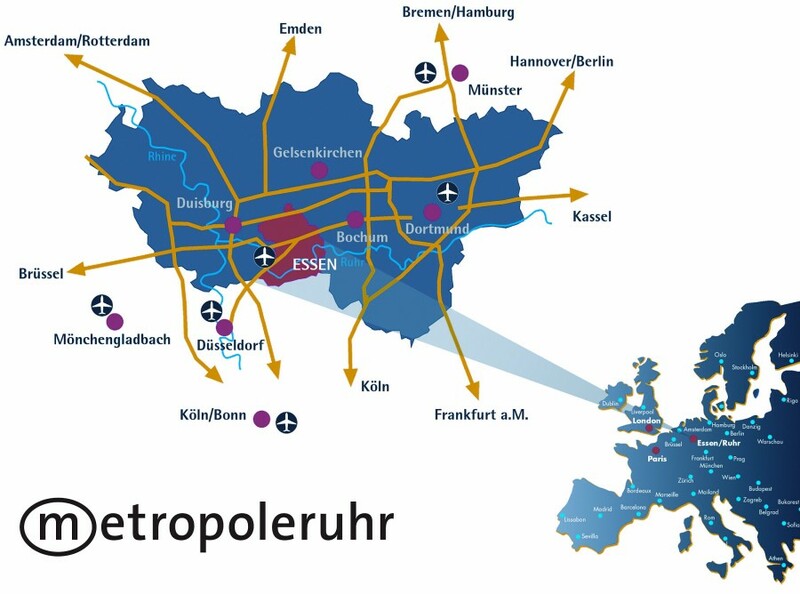 As central as it gets: London, Paris, Luxembourg, Brussels, Amsterdam, Frankfurt and Berlin - Europe’s political and economic centres are within 500 kilometres of Essen. And it’s only a little further to the major cities of Munich, Prague and Copenhagen. It could hardly be more convenient - or more flexible to get to Essen. Thanks to its central location in the heart of the Ruhr district, it is easily accessible by car, train and plane. The city is connected to the national and international motorway network via the A40, A42 and A52. Over 100 InterCity, EuroCity and InterCityExpress long-distance trains stop at Essen’s main railway station every day. 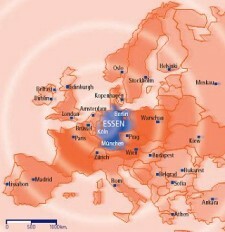 Travelling from Hamburg takes three hours, just under four from Berlin and Munich is only around five hours from Essen. And within the city itself, the principle of short distances still applies: all main tram and subway lines stop at the main station; additional bus lines stop at destinations throughout Essen. It only takes 20 minutes by car to reach Dusseldorf International Airport via the A52/A44, and trams on the S1 line as well as several regional express and long distance trains connect Essen with the airport (roughly a 21-minute journey). Other airports nearby include Cologne/Bonn (around an hour by train), Dortmund and Weeze (approximately 45 minutes by car).